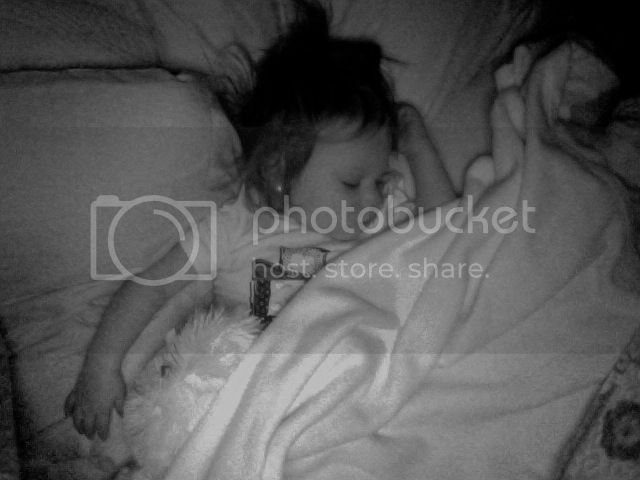 I have never been one for co-sleeping..
That does not mean that we have never let her sleep in our bed.. but i feel that everyone gets a better nights sleep when we are in our own spots..
Tonight is different.. ty has been gone for 6 days now, lex was a super daddys girl before he left & has constantly been calling for him ever since.. which is really sad to hear! She is starting to understand things.. but kinda not?! She has no idea where or why he's not here and still expects to see him places we go.. He drove 12'ish hours today and is in Nebraska.. and he has 13 1/2 more hours to drive tomorrow to be here in Memphis.. with us! A while back I talked about some exciting news I had just found out about.. well that exciting news was that we were moving to Memphis (my hometown) for Tysons off track in school for his job (just 3 months)... sadly Idaho-Tennessee makes for a long drive! I just stayed here from Christmas b/c a one way ticket back to TN was kinda on the ridiculous side!! Anyways, Lex has been on a melt down kinda phase.. tonight it was over putting her diaper back on and getting her into her pjs. it was huge, humorous, then on the verge of ridiculous! She finally calmed down and I went to put her down.. I held her for an extra long time tonight.. and the second i put her down into the crib she started crying (this is not too uncommon and normally doesnt last too long) well it lasted longer than normal and you could tell she was just totally upset... so i go back up and try calming her down and holding her again... then lay her back down.. same thing. After a while of her being super upset I went back and got her.. this time I just took her out of the room (10:15) put her originally down around 9. So I end up just going and laying down with her in my bed and I had my phone with me.. she saw the light flash on it and immediately wanted to hold it.. so I said do you want to call daddy? and so I did... she knows its him when it calls him. it has his picture and she is a little too familiar with how my phone works..
sooo as soon as he answers she goes into this dramatic scream and crying.. super sad cry.. like wanting him to hold her through the phone type of cry. so sad to see.. so she wouldnt let me hold the phone so he sat on speaker phone with us for a good while.. she snuggled on my chest right along with the phone.. she was wanting comfort from him through the phone.. it was kinda weird. I had been worrying about him driving (nothing new) but it kinda set off an extra alarm with how weird Lex was acting toward him on the phone tonight.. like she needed him right then. Even Ty mentioned it kinda sketched him out with the way she was acting.. so once he said that I immediately said well maybe you should just stop at the next big city.. then a couple of minutes later he put me on hold b/c his grandmother was calling. He comes back on the phone and tells me she called to tell him he should probably call it a night. Um ok #4 person that thinks you should stop.. so he pulled over at that exit. No clue if anything would have even happened but I'm resting here easier knowing he is safe and not on the road so late! Moral of my story... there are nights like tonight that remind me of how thankful I am for my little family & how much I need them. And there are nights where you break the "mommy/daddy rules" and snuggle with your extra sassy 18 month old baby, even if it means you won't get a good nights sleep! because, she needed a little extra love and comfort tonight! That's sweet how much Lexi loves her daddy. She is a sensitive little thing. It's always unsettling when your husband is on a trip. I always have those "what if" thoughts that keep me up at night. It's good that you guys followed those promptings. They definitely happen for a reason. Cute post! I kind of love when we break the "mommy/daddy" rules. The pictures are so sweet. Excited for you guys to be able to spend time in Memphis for a bit! So sweet. Glad y'all will all be together again soon. Save travels to Tyson. Sounds like the rules must be broken again once Tyson returns. 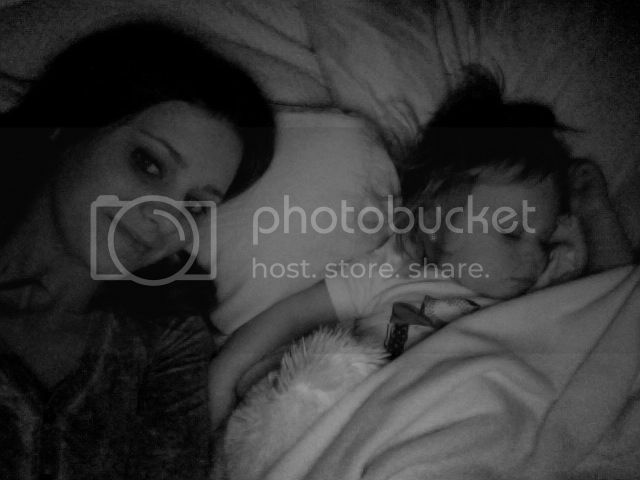 Slumber party in mommy and daddy's bed! i'm a big believer on sleeping in our own beds too, but we've broken the rules a couple of times when ben is out of town for work too. i think it's gotten harder as taytum has gotten older for him to be gone. that's nice you get to be in warmer weather during the coldest months in idaho! i'm jealous!